It’s beginning to feel a lot like Christmas. Between Christmastime coming to my home in Martha’s Vineyard, seeing friends from Christmas past at the Junkyard, and finding new friends at Calas Galadhon, this year’s Christmas is feeling so wonderful. I made a few changes to the house at Martha’s Vineyard since moving in. The main change is adding a kitchen where the bedroom had been, but I’ve also added more Christmas decorations. Btw, those gorgeous Xmas boxes are only 1-prim each (Antique Artistry)! I’ve caught a couple shows at the new concert area over at Fort Sewell on Marblehead. If you click on the photo you can see singer/musician Bu Drucot on stage. 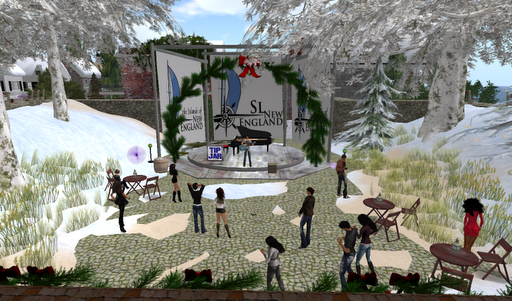 You can join The Islands of New England group to get notices of concerts or check the Islands calendar. I’m here at the Christmas Angels benefit @ Junkyard Blues. If you look real close you see me in the bright red dress on the left. Dreamgirls filled the Yard that night and I was proud to wear my Dreamgirl tag. Although Reed isn’t usually on till later in the evening, we’ve even been getting some dancing and prancing in. Well, I do the prancing. hehe. Here we are at Christmas Pavilion. And last night I caught Duncan Bagby‘s wonderful show at Truck & Ty’s Christmas Pavilion. 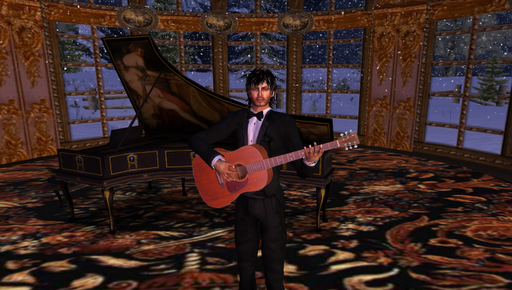 Duncan performed many wonderful Christmas songs with his charming voice and instrumental stylings. I’ve “Been Bagged” since I caught my first Duncan performance a few months ago. As you may have noticed, I’ve been getting a lot of mileage out of my pretty green Christmas outfit. So, I need to get out today and get something new for the parties this weekend. The concerns I had that this might not be a good Christmas, as it rolled up on the calendar, have been slowly replaced by some wonderful and unexpected seasonal joys. Even though I believe Halloween is the Second Life National Holiday, I am finding that Christmas is equally special with it’s own experiences. 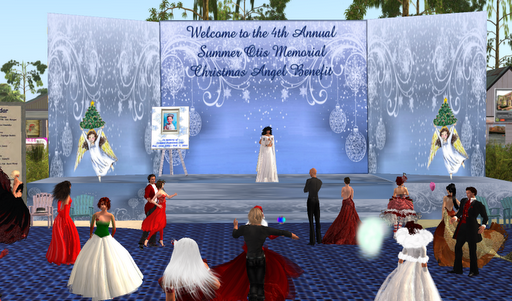 This entry was posted in Journal and tagged Community, Holidays, Parties, Photography, Second Life, Talented Artists. Bookmark the permalink.